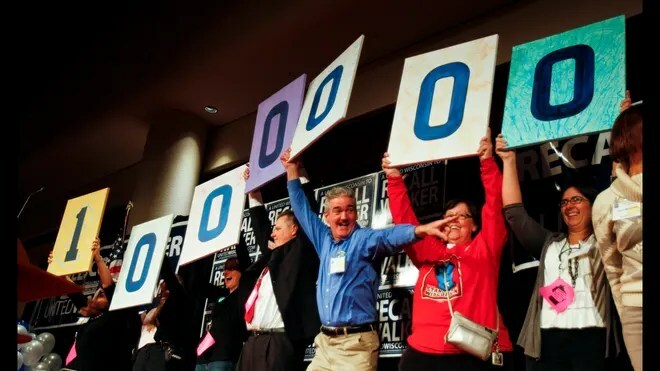 Several months ago though, with the recall of state senators, and the defeat of a referendum in Ohio, it seemed like just the opposite was true and that organized labor was back due to Republican overreach. Regardless of Tuesday’s results, it appears that the labor movement has been weakened through the recall process. President Obama himself has ignored the Wisconsin recall. And other Democrats, with the exception of Debbie Wasserman-Shultz, the DNC chairwoman, have tended to downplay the importance of the vote. This tells us two things: One, that the president has distanced himself from the labor movement. And that may be because of fact number two that Democrats in general lack confidence in labor’s ability to secure a victory, even in the rust-belt. With polls in Ohio now showing the presidential race effectively tied –remember that Romney publically embraced Walker while campaigning in Wisconsin during the primaries — and with Walker apparently headed to a narrow victory, there will be every reason for Republicans, who have invested an enormous amount of money, time, energy and yes– prestige– in the state, to conclude that their approach to state and municipal finance has popular support. With Wisconsin as one of the key 11 swing states in America, and with Wisconsin not having gone Republican since 1984, the results Tuesday could be a harbinger of doom for Obama, and could embolden a Republican party that until recently, has been on the defensive in the state, and arguably the nation. (Rowman and Littlefield). Follow Doug on Twitter @DouglasESchoen.